I am learning Backbone.js so I can re-write the main GUI for KTOMG. I am still learning and I've run into a couple gotchas that I hope I can clear up for anyone else that dares to tread in these woods. Still, I've been able to rewrite the listing of a user's library in one night using Backbone and all my existing back-end code (the farthest up I edited was my controller). Very impressive for a Backbone n00b! After watching the PeepCode screencasts (I, II, and III), I have realized something about Backbone. Backbone will pretty much replace your MVC views and controller logic. Backbone doesn't necessarily have to be your whole app. In fact, right now I am only using Backbone for the main "library" interface and I am keeping the rest of the site in plain-old MVC 3. You still use your controllers and could even use your Razor views as HTML templates. Considering those points, I felt a lot better about using Backbone. Not only will it be a great experience, it'll also make the most important part of my application very responsive and robust, without needing to worry a ton about the plumbing. Who knows? Maybe KTOMG will be running on Node.js by the end of the month. There were a few gotchas I ran into when using Backbone in my typical .NET environment. Good fodder for a T4 template. If you have a larger site, consider using an Api MVC Area for cleaner separation. I ran into two gotchas with serializing my objects. First, if you have an Id property/field, Backbone will not be happy. It needs to be lowercase id. You should utilize the idAttribute option on your Backbone model to override the property name. It took me forever to figure out why nothing was happening when I deleted a model. Second, if you are going to serialize EF entities when proxying or lazy-loading is enabled, you need to use a serialization framework like JSON.NET or you need to make flat DTO objects (or view models). I opted for the latter approach first because it was quick, but I am in the process of implementing JSON.NET to do serialization of my entities for me. For EF serialization, you need to use a custom ContractResolver. I borrowed this one. Furthermore, I also needed to set the ReferenceLoopHandling to Ignore on a new JsonSerializerSettings object so it would avoid circular references. Finally, this is optional but considering the first gotcha, I highly recommend you inherit the EF contract resolver above from CamelCasePropertyNamesContractResolver so your JSON is serialized with camelCase properties. I haven't actually tried this, but I don't see why it wouldn't work. In a Backbone project you'll typically have plenty of templates. Right now I have 3 but I expect it to grow quite a bit in the future. I was planning on moving all these templates to .cshtml files and then using @Html.Partial("_TemplateName") to include them in my main layout. I may even create a small extension method to wrap that in a <script> tag. I will update this post if I do. If you happen to be working on an OSS project, you should be using Cassette because it can package up your HTML/Knockout templates and include them all in your page for you automagically. If I wasn't using AppHarbor and I was using a dedicated server, I would buy Cassette in a second. I wish they had per-site licenses. It's up to you how you like to organize, and perhaps you'd even like to separate it further down into modules. It's much nicer to write in Backbone without all those pesky parenthesis and manual bindAll or extend shenanigans. 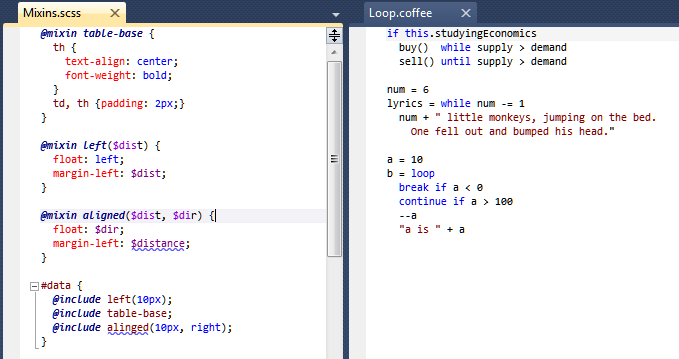 Again, I'd recommend PeepCode's CoffeeScript screencast, that's about all it takes to learn it properly. If you do decide to take the plunge (it's worth it! ), get yourself Mindscape Web Workbench and you'll be a much happier camper when working with Coffee, SASS, and LESS in Visual Studio.